Congratulations to Joe Cook of the Hobart City Band and Alex Quigley of Launceston College for winning the 2013 Open and Junior Champion of Champions respectively. This is the first time that Alex has won the W.J. 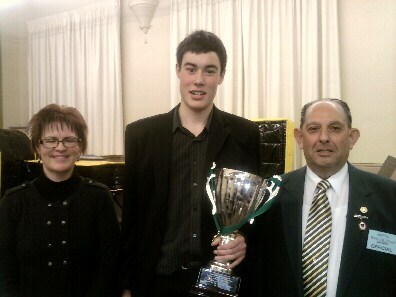 (Wally) Bentley Memorial Trophy for Tasmania's premier junior brass soloists. Joe managed to secure his tenth Ivan & Aileen Johnston award for the most outstanding brass soloist. The 2013 Solo and Party Championships were conducted at the Launceston College Music Center on the 6th & 7th July. The Chief Adjudicator was Dr. Kevin Cameron of Adelaide with Mr. Sean Priest adjudicating the junior brass classes and Mr. Derek Grice the woodwind and percussion sections. 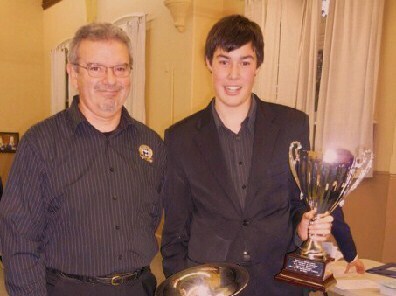 Pictured left is Open Champion of Champions Joe Cook with adjudicator Dr. Kevin Cameron. On the right is Junior Champion of Champions Alex Quigley pictured with adjudicators Sean Priest and Dr. Kevin Cameron. 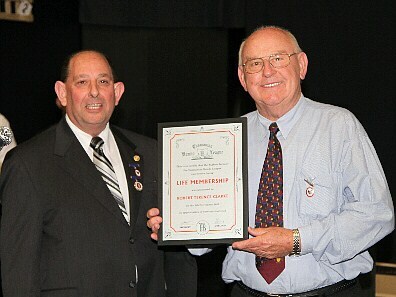 Robert (Nobby) Clarke was awarded Life Membership of the Tasmanian Bands League at the 140th anniversary celebrations of the Latrobe Federal Band held on the 9th November 2012 for his significant, extraordinary and outstanding service to banding in Tasmania. Robert joined the Latrobe Federal Band as an eight year old in 1950 under the tutelage of the renowned Latrobe Conductor Lou Coventry, M.B.E. He commenced his playing career on cornet before the demands of the band necessitated a move to Bb Bass in 1966. Robert has been and continues to be an active and integral member of the Latrobe Federal Band for 62 continuous years as a playing member. For this alone he deserves commendation and recognition. Throughout his time with the band he has been actively involved in all facets of the organisation. He has held numerous roles within the band such as Junior Vice President, Assistant Secretary, Canteen Manager, a long standing committee member and the driving force behind the band's social activities. As a player, he continues to show commitment and dedication and has rarely missed a practice or engagement during his entire playing career. He has long been heavily involved with fundraising activities for the band and was for many years the backbone of the band's largest annual fundraiser catering for the patrons of the Latrobe Bike Racing Carnival. Robert is always the first member to volunteer his time for working bees and continues to be almost instrumental in towing the band's trailer complete with a full complement of gear to concerts. Such was Robert's esteem within the band he was granted Life Membership in 1972. Robert has never been one to simply "turn up to practice". Robert has always been a major force behind the development of Latrobe's learner and junior bands. Many of the current band members can attest to this as a healthy proportion of the players that have comprised the Latrobe Federal Band have been products of his learner's programme. Robert has produced young players who have gone on to greater musical endeavours not only within the wider Tasmanian banding community but also Nationally and Internationally. Although never a bandmaster in his own right, Robert has been the one constant in assisting Latrobe's learners for more than 40 years. Robert provides constant support for young players as they become teenagers showing them direction, purpose and guidance not only as musicians but also in helping to shape well rounded young citizens. Robert continues to be an outstanding role model for the youth of Latrobe and an exemplary illustration to the wider brass banding movement in general. Robert has participated in almost every Tasmanian banding contest since the formalisation of the "D Grade Bands Contest" in 1953; competed at eight Ballarat Competitions (1965, 1974, 1975, 1976, 1977, 1978, 1983 & 1984); eleven National Contests (1964, 1969, 1974, 1985, 1986, 1987, 1992, 1993, 1994, 2000 & 2004) and the Open Edinburgh Open Invitation Brass Band Championships as part of the Latrobe Federal Band's successful tour of the UK during August/September 1979. To his outstanding credit Robert has never once missed participating in Latrobe's ANZAC Day parade in his entire banding career. It is impossible to adequately surmise the value of a member such as Robert not only to the Latrobe Federal Band but to Tasmanian banding in general. Robert is a truly passionate brass bandsman, known and respected Nationally, who continues to journey throughout Australia attending competitions and concerts even when not competing. Robert has made banding culture his life and has previously been awarded the TBL Badge of Honour in 1992, TBL Jubilee Certificate (for 50 years service) in 2002 and the Latrobe Municipality Citizen of the Year Award in 2006 for his outstanding service to the greater Latrobe community. It is certainly a befitting tribute for Robert to receive Life Membership of the TBL as part of the 140th anniversary celebrations of the Latrobe Federal Band: Australia's oldest continuous brass band. Edward (Ted) Hicks was awarded Life Membership of the Tasmanian Bands League at the 140th anniversary celebrations of the Latrobe Federal Band held on the 9th November 2012 for his significant, extraordinary and outstanding service to banding in Tasmania. Ted has been an active member of brass banding in Tasmania since 1951. He began with Latrobe Federal Band as a junior member under the direction of Lou Coventry, M.B.E. following an entrenched Hicks family tradition of band membership stretching back to Latrobe's formation in 1872. After 61 years, Ted is still heavily involved with the Tasmanian brass banding fraternity and is currently the musical director of both the Latrobe Federal and Devonport City Bands and most recently the conductor of the "Mersey Brass" combined band. As a junior, his musicianship was second to none. In October 1953 Ted appeared at one of his first public performances playing the tenor horn solo "Because" at a junior talent quest conducted by the Latrobe Band in the Capitol Theatre, Latrobe. Ted was beaten by a point in the talent quest by piano playing toddler named Margaret Davis who "had difficulty reaching the pedals and keyboard of the piano". Probably not the only time that Ted has lost out to the "cute factor" in his life! In August 1954 (at the age of 13) Ted won the Junior Eb Horn solo on the opening day of the Devonport Eisteddfod with a score of 82 points - 11 points ahead of second place getter Geoffrey Neilsen of Launceston. Ted also came second (by a point) in the Open Eb Tenor Horn Solo which was won by R.A. Dawson of Burnie. Adjudicator John Holland said of the performance "Rarely have I heard a young player with such good control and tone on this instrument". Ted was also part of the winning Junior Brass Quartet. In 1955, Ted was both the Junior and Senior Tenor Horn Champion of Tasmania. In 1957 he was Junior and Senior Soprano Champion of Tasmania. He was also awarded the Alf Buck Memorial Award at the Devonport Eisteddfod for the most outstanding soloist in 1961 and 1964. 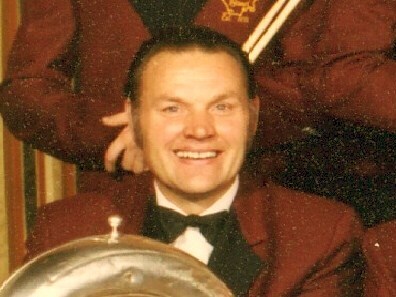 Ted's contributions to the Tasmanian Banding movement have not only been as a player but also as an adjudicator, musical director and educator. Ted has adjudicated at the TBL Solo & Party Contests on seven occasions (1993, 1994, 2001, 2002, 2003, 2004 & 2008), at the Junior TBL Band Championships in 1999, the Senior TBL Band Championships in 1994 & 2001 and at the Devonport Eisteddfod on numerous occasions. Although the majority of Ted's playing history has been with the Latrobe Federal Band, he has also shared his musical ability with a number of other Tasmanian bands, both as a player and musical director. In 1968 Ted played both Soprano and Tenor Horn with the Preston Municipal Band under the leadership of Charles Smith (a bandmaster of elderly years famous for conducting with a pencil and throwing it at players when they made mistakes). The band won the 1968 Victorian "A" Grade Championships. Ted still speaks very fondly of their Own Choice performance of "Roman Carnival" - something he will later reflect upon during the 1979 UK Tour. Other highlights of his career occurred in 1976 and 1979. In 1976 Ted arranged the hymn tune "Jesus Himself Drew Near" for Latrobe. With this arrangement, the band won the "A" Grade Hymn Section at the Royal South Street Contest in Ballarat. In August/September 1979 Ted was a part of Latrobe Federal Band's UK Tour. It is on this tour that Ted experienced one of the most musically satisfying moments of his banding life - listening to 22 bands perform the test piece "Roman Carnival" at the Belle Vue Contest in Manchester. Ted became the caretaker Bandmaster of Latrobe from December 1979 until March 1982 owing to the resignation of Trevor Reid. In 1989 he became the conductor of the City of Devonport Brass Band, whom he lead to their only Tasmanian "C" grade title to date in 1990 at the TBL Band Championships held in Devonport. In October 1992 Ted became the conductor of the City of Launceston Brass (now RSL) and lead them to their first Tasmanian "B" Grade title at the TBL Band Championships held in Launceston the same year. Ted later lead the Launceston Railway Silver Band to their first Tasmanian "D" Grade title in 20 years at the TBL Band Championships held in Latrobe in 1997, a feat which he repeated 11 years later at the TBL Band Championships also held in Latrobe in 2008. Ted has repeatedly proven himself as an excellent clinician and trainer of bands and Tasmanian bands have enjoyed much success under his close and exacting direction. Throughout his banding career, Ted has primarily dedicated himself to the improvement of those in the junior ranks. He served as Junior Bandmaster at Latrobe in the early 1970's and reprised this role in late 1983 when Latrobe experienced something of a junior Renaissance due to a close working relationship with Peter Quigley and the Don College's Mersey/Leven Youth Brass Band programme. At the age of 71, Ted continues to teach the brass musicians of the future at Nixon Primary School in Devonport, as well as assisting once again with the Latrobe Federal Youth Band programme. Ted has been a long standing and valued member of the Latrobe Federal Band and was granted life membership in 1972. He has also been a very active member of the TBL, has served as a member of the Musical Advisory Board for many years and received his TBL Jubilee Certificate (for 50 years service) in 2002. His excellent musicianship and passion for the brass banding movement is what defines him. Since retiring, he has finally been able to do what he has always wanted, which is to spend his time living and breathing brass bands and music. He recently said at a rehearsal that he was available "twelve hours a day, seven days a week" for any person who wanted extra tuition. It is this kind of dedication that deserves formal recognition. It is certainly a befitting tribute for Ted to receive Life Membership of the TBL as part of the 140th anniversary celebrations of the Latrobe Federal Band: Australia's oldest continuous brass band. Congratulations to Jessica Crabbe of Kew Band Melbourne and Anthony Douglas of Ulverstone Municipal Band for winning the 2012 Open and Junior Champion of Champions respectively. This is the first time that Anthony has won the W.J. 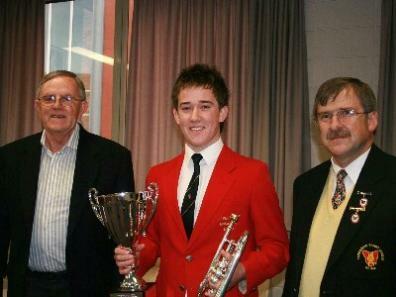 (Wally) Bentley Memorial Trophy for Tasmania's premier junior brass soloists. Jessica managed to take out the Ivan & Aileen Johnston award for the most outstanding brass soloist with a very musical performance of the baritone solo "Fantasy on Swiss Airs" by Roy Newsome. The 2012 Solo and Party Championships were onec again conducted at the Launceston College Music Center on the 2nd & 3rd June. The adjudicators at this year's event were Mr. Mark Ford of Victoria and Mr. Glenn Schultz of Tasmania. 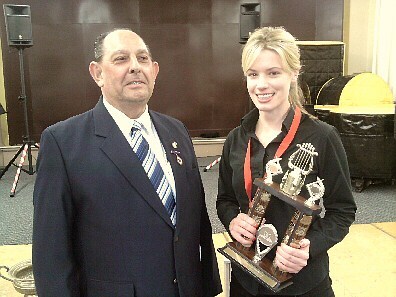 Pictured left is Open Champion of Champions Jessica Crabbe with TBL President Mr. Gary Weeding. On the right is Junior Champion of Champions Anthony Douglas also pictured with TBL President Mr. Gary Weeding. Congratulations to Nigel Elliott of City of Devonport Brass and Jack Adolph of Hobart City Band for winning the 2011 Open and Junior Champion of Champions respectively. This is the second time that Jack has won the W.J. 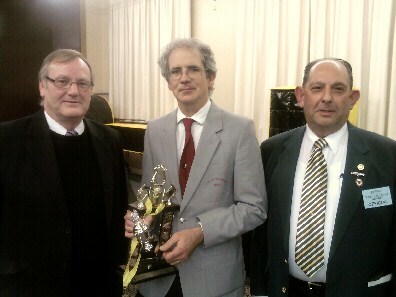 (Wally) Bentley Memorial Trophy for Tasmania's premier junior brass soloists. Nigel managed to secure his 4th Ivan & Aileen Johnston award for the most outstanding brass soloist - his first since 1991. Nigel also took out the Arthur White Trophy for the highest points gained in a solo for his rendition of Friedebald Grafe's "Grand Concerto" for which he was awarded 96 points. The 2011 Solo and Party Championships were conducted in the Launceston College Music Center on the 4th & 5th June. 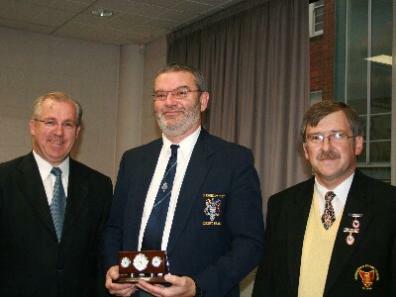 Pictured left is Open Champion of Champions Nigel Elliott with Chief Adjudicator Mr. Ken MacDonald of Victoria and TBL President Mr. Gary Weeding. On the right is Junior Champion of Champions Jack Adolph with Adjudicator Mrs. Carolyn Cross and TBL President Mr. Gary Weeding. Sue Peters was awarded the Tasmanian Bands League Badge of Honour by the Guest Chairman Dr. Frank Madill (Vice Patron of the TBL) at the Annual General Meeting held on the 13th February 2011. Sue has contributed to the TBL and its objectives through service as a volunteer administrator. She became involved with the City of Launceston Brass (now City of Launceston RSL Brass) in the mid 1990s. Although not taking a formal role, she assisted at playouts, provided administrative support to the then Secretary, Peter Calcraft, and made a major contribution to fundraising. In 1995, Sue offered to assist with the running of the State Solo and Party contest, and has continued to do so for the past 15 years, variously collating own choice music, compiling results and other admin tasks as requested. She has helped with a number of State Championship and with other League activities, such as the organisation of State Band events. In her 2010 annual report, as outgoing Secretary of the League, Wendy Martin made special mention of Sue's contribution, "As in all organizations, there are people working quietly in the background, but without their help and support things would not run as smoothly ... Sue Peters ... has helped me at all competitions and always given me an ear when things were hard going as well as reminders when things had been forgotten. ..."
Sue has also brought credit to the League through the assistance to the National Band Council of Australia, mainly through providing administrative support to the NBCA Contest Liaison Officer and providing advice to interstate organising committees. 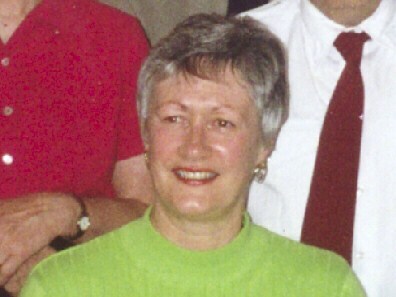 In his report to the 2010 NBC Conference, Robert Bedwell said "I must pay homage and thank you to Sue Peters for her valuable and ever friendly assistance, not just in assisting to collate and check results ... Sue and I have teamed together at quite a number of Australian National Band Championships now ...". Sue's most significant and noteworthy contribution to the League has been through her central role in the running of the 2000 and 2004 National Band Championships. In March 1999 Sue left paid employment to take up the position as Administrator/Organising Secretary of the 2000 championships in Launceston. For the ensuing sixteen months, she devoted herself full time to the organization and conduct of the event. Her attention to detail, high level of organisational skills and participant-centred approach ensured that the championships were highly successful. When the League agreed to the State Government request to apply for the 2004 Championships, Sue again volunteered to take up the major role of Administrator and dedicated the best part of two years to the organisation of the 2004 event, again in Launceston. Her task was made more difficult due to a move to Hobart in March 2003. Notwithstanding this, her attendance at committee meetings and liaison with venues, sponsors and suppliers of services in Launceston continued undiminished. The event was again highly successful, for which Sue deserves much of the credit. Although not in a position to join the committee for the 2010 Nationals, Sue again made an important contribution. At the outset, she volunteered to compile and produce the Official Programme. The finished product was both comprehensive and professional. When the organising committee encountered some difficulties with the sourcing of trophies, Sue volunteered to assist. The result was a set of professionally, but economically, produced specialty timber trophies which were well received by the recipients. Additionally, Bob Kuns, Contest Administrator for 2010, remarked on several occasions that his role was made easier by the quality of the documentation that Sue had handed on to him from 2000/2004. Accordingly, it is submitted that the contribution to the League by Sue Peters has been significant and over an extended period and that she is deserving to be awarded the Tasmanian Bands League Badge of Honour. Congratulations to Joe Cook and Jack Adolph, both of the Hobart City Band, for winning the 2010 Open and Junior Champion of Champions respectively. This is the first time that Jack has won the W.J. 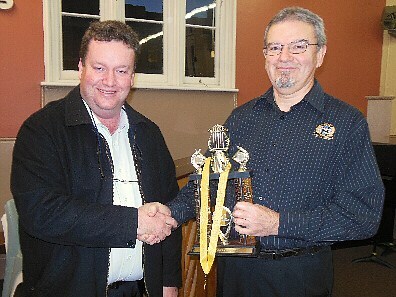 (Wally) Bentley Memorial Trophy for Tasmania's premier junior brass soloists. Joe managed to secure his ninth Ivan & Aileen Johnston award for the most outstanding brass soloist. The 2010 Solo and Party Championships were conducted at the Launceston College Music Center on the 29th & 30th May. The Chief Adjudicator was Mr. Ben Fixter of Victoria with Mr. Peter Quigley adjudicating the junior brass classes. Mrs. Carolyn Cross assisted with the adjudication of the Junior Champion of Champions. 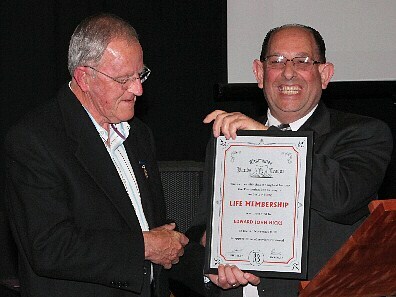 Jan (John) Winkel was presented with his Jubilee Certificate (50 Years Service) at the Tasmanian Band Championships, Latrobe on the 12th October 2008 by David Peters, President of the TBL. Jan was born in Holland and started playing music when his father taught him to play the baritone at the age of 9 or 10. During these years music wasn't taught in Dutch schools. At the age of 14 or 15, Jan took an apprenticeship in the agricultural services where he learnt "a bit of everything". In 1957 Jan made the life changing decision to immigrate to Australia under the Sir Robert Menzies' Skilled Migration Scheme. The scheme involved a two year contract which meant that should Jan wish to return to Holland before the contract had expired, he would need to do so at his own expense. Initially Jan was planning to work in Victoria but eventually ended up in Tasmania - a place that he didn't know existed at the time! Jan initially lived in the Montagu Swamp region of Circular Head located in the north west of the state. It was whilst living at Montagu Swamp in 1958 that Jan joined the Circular Head Brass Band and furthered his musical interests by playing the tuba. Jan found participating in the Stanley Show and ANZAC Day parades particularly enjoyable. Jan relocated to the Devonport area in 1959 where he found employment at Sullivan Motors. He later worked with the Hydro at Gowrie Park during the boom years, Websters and Blackwood Hodge. Jan completed his working career at Simplot Harvesters prior to his retirement. It was while visiting the Devonport Show in 1959 that Jan met Elaine, the love of his life, and the two were soon married. Jan and Elaine had four children including two brass playing daughters. Jan joined the Devonport Brass Band in 1960, becoming a stalwart of the organisation, with the exception of a two year stint as a member of the Latrobe Federal Band during the mid-1980's. During his time with Devonport Jan has held every position on the band committee and taught countless students to play brass instruments. This year marks Jan's 50th anniversary playing in bands associated with the Tasmanian Bands League: a milestone that not many players manage to accomplish. It also coincides with Jan's 70th birthday - an even greater reason to celebrate. Congratulations to Joe Cook of Glenorchy City Concert Brass and Curtis Willcox of the Ulverstone Municipal Band for winning the 2008 Open and Junior Champion of Champions respectively. This is the second time that Curtis has won the W.J. 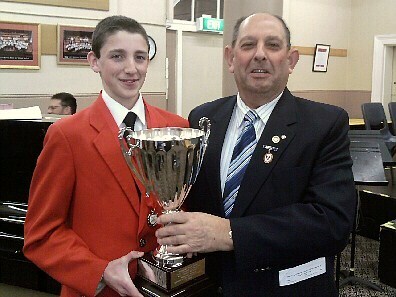 (Wally) Bentley Memorial Trophy for Tasmania's premier junior brass soloists. Joe managed to secure his eighth Ivan & Aileen Johnston award for the most outstanding brass soloist. The 2008 Solo and Party Championships were conducted in the Launceston College Music Block on the 31st May & 1st June. 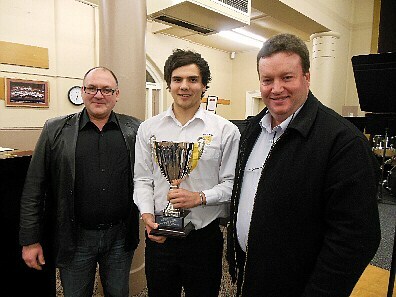 Pictured left is Open Champion of Champions Joe Cook with Chief Adjudicator Mr. Ken Waterworth of Victoria and TBL President Mr. David Peters. On the right is Junior Champion of Champions Curtis Willcox with Adjudicator Mr. Ted Hicks and TBL President Mr. David Peters. Simon Reade, the Musical Director of the Hobart Concert Band was awarded the Tasmanian Bands League Badge of Honour for his services to banding in Tasmania at the Annual General Meeting held on the 10th February 2008. 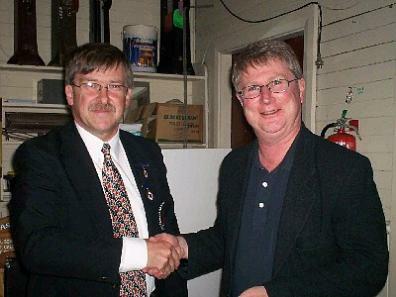 The photograph shows Simon being presented with his badge by David Peters, President of the TBL at the 2008 Solo and Party Championships on the 1st June. Simon, a graduate of the Tasmanian Conservatorium of Music with a Bachelor of Music in Composition, was elected Music Director of the Hobart City Band in 1997 when the band consisted solely of a "B" Grade Concert Band of approximately 30 members, the Brass Band having been suspended in February 1992. Under Simon's direction, the band has expanded and upgraded to the following remarkable extent. Hobart's Open Concert Band has grown to a membership of approximately 60 members. It won the "B" Grade State Championships from 2004 to 2006 and was National "B" Grade champions in 2004. The band was upgraded to "A" Grade Open in 2006 and won the "A" Grade Open Concert Band State Championships and placed second in the National Championships in their first competitions. Over half the band are under the age of 19 with the majority of the remainder under 30. The Hobart Development Band was formed in 1998 to provide a venue for beginners and people learning a new instrument, which was also used as a source of instrumentalists for the concert band as well as a training band for budding conductors. This band was accepted as a "C" Grade Junior Concert Band at the most recent TBL Committee Meeting. A high-quality swing/stage band was formed in 2001 with Simon conducting and playing trumpet. This band is extremely popular and is always called upon annually for the Government House Open House and the Cancer Council's Hobart "Relay for Life", in addition to numerous private bookings. The Hobart Brass Band was reformed in 2003 with Simon playing cornet and conducting periodically. The band started competing again as a "D" Grade Open band at the 2004 State Championships, which they won. They were upgraded to "C" Grade and placed second in the 2005 State Championships, subsequently winning in 2006, when they were upgraded to "B" Grade. They won both State and National "B" Grade Open Brass Championships in 2007 for the first time since 1971. The Junior Concert Band was formed in 2004 as a "C" Grade band, winning both the State and National Championships in that year. It has also been used for intermediate training of young conductors. They were upgraded to "B" Grade and won the State Championships in 2005, 2006 and 2007 as well as placing 2nd at the 2007 National Championships in 2007. They were upgraded to "A" Grade at the most recent TBL Meeting. The Junior Brass Band was formed as an ensemble in 2007 and has grown quickly, being accepted as a "B" Grade band at the last TBL meeting. In addition to band camps specific to Hobart City Band, Simon has recently conducted a camp for junior instrumentalists through Tasmania which was highly successful, attracting a number of new members to the junior bands. None of the above could have been accomplished without Simon's vision and high level of personal commitment. When Simon is not conducting or playing in one of the bands within Hobart City, he teaches music full-time at Clarence and Ogilvie High Schools in the Hobart Region, He is also the Music Director of the Tasmania University Musical Society choir, which has performed and recorded with the Concert Band frequently, conducts the Tasmanian Youth Orchestra, and plays with the Glenorchy City Concert Band. In his spare time, he somehow manages to compose and transcribe for band, choir and voice, with a one-act opera having been performed recently and the Hobart Concert Band recording a CD of his works in mid-2007. As can be seen from the above, he has not only been the basis for major improvement of banding in Hobart, including significant national awareness, he has ensured the future for local concert and brass bands. This effort is more than worthy of the TBL Badge of Honour. Dean Hunt, the Musical Director of the Glenorchy City Concert Brass was awarded the Tasmanian Bands League Badge of Honour for his services to banding in Tasmania at the Annual General Meeting held on the 11th February 2007. 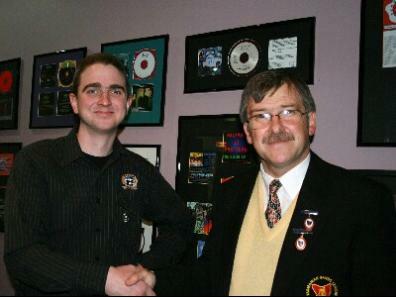 The photograph shows Dean being presented with his badge by David Peters, President of the TBL. Dean has displayed a dedication to excellence in brass music that has seen the Glenorchy City Concert Brass elevated to "A" Grade in 1996 when it became Tasmania's first "A" Grade brass band. This grade is at an exceptionally high standard. Brass Bands achieving this status typically are drawing on professional players and larger city based populations. Some had thought it impossible for Tasmania to have a band at "A" Grade level, let alone maintain that level for ten years. There are less than twenty regularly competing "A" Grade brass bands in Australia, and most are based in the larger capitals. As a lad in his home town Smithton, Dean would insist that his father take him to the footy ground where the Circular Head Brass Band would be doing marching practice on Sunday mornings. This interest in brass bands was perhaps a hint to as to what he would go on to achieve in music later. In 1969 at the age of ten Dean got his chance to learn to play brass at St Brendan's College in Devonport. One of his teachers, Brother Shacklock was determined to have a school band and managed to obtain some old instruments from the Devonport Municipal Band and the Latrobe Federal Band. Dean joined the Devonport band in 1971 which was his first involvement in a band that was affiliated with the Tasmanian Bands League. Dean went on to become principal cornet of the Devonport band, and also played with Ulverstone and Latrobe bands on many occasions. Dean's education took him to Hobart to attend University and the Conservatorium of Music in 1974. Dean played with the Hobart City Band and the Australian Army Band from that time through until 1979. Most of this time the band was under the direction of Gordon Sheedy. In this era, the Hobart City Band was the premier band in Tasmania regularly winning "B" Grade in the State Championships. Dean joined the RSM Band in Hobart in 1979 under the direction of Arthur Edwards. RSM through a couple of name changes became the Glenorchy City Concert Brass in 1983. Dean Hunt was appointed Musical Director of the Glenorchy City Concert Brass in 1989 and is still in that role today. After a successful career with the Department of Veterans Affairs, Dean chose to teach music full time, firstly within the private school sector and then for the last ten years with the State Education Department. Dean is an accomplished cornet player and won numerous medals and the Alf Buck memorial trophy at the Devonport Eisteddfod in 1995 for the most outstanding performance. The following are some of the results achieved at State and National competitions as the conductor of Glenorchy. There are many more achievements with other grade and junior bands. "B" Grade Tasmanian Champions: 1989, 1990 & 1995; "B" Grade National Champions: 1993 & 1996; "A" Grade Tasmanian Champions 1996 to 2006 inclusive. Best results in the "A" Grade National Band Championships have included coming 6th out of a field of 14 bands in Melbourne, 1998 and 3rd out of a field of 15 bands in Newcastle, 2003. There are many times in the community when a high standard band is required to support significant community events. These include various ceremonial and community events. Dean has prepared the Glenorchy City Concert Brass to perform at events including Australia Day ceremonies, ANZAC Day, Carols by Candlelight and numerous concerts. Glenorchy City Concert Brass have always had an active and successful youth development program under the direction of Dean Hunt. Over the years this has included various learner groups and a junior brass band group. It varies from year to year but in 2006 forty three students took advantage of this program. This requires Dean to teach students from raw beginners through to competent young musicians. It requires hours of individual lessons, learner class and conducting a youth band. Dean encourages and trains many in these groups to participate in solo, ensemble and band competitions around the state. Dean has been an active delegate to the Tasmanian Bands League since his appointment as Musical Director of Glenorchy City Concert Brass. His many contributions have included being a member of the League's Musical Advisory Board which selects music appropriate to state and locally run national competitions for all bands and solo events. He has taken on the role of Chairman of the Board and provided strong leadership for several years, including choosing the test music for the 2004 Nationals. Under Dean's leadership the Glenorchy City Concert Brass members have been encouraged and coached to participate in all TBL and TBL associated events such as the State Band Championships, Solo and Party Championships, music camps and state bands etc. In 1996 the TBL wanted to form a state wide representative brass band to celebrate its 50th year since inception. Dean was a driving force behind establishing this band and has put together the State Band program which has run five times since. This has afforded an opportunity for Tasmania's players to gain experience playing at an "A" Grade level, and just as importantly, developing the friendship and sense of community in the Tasmanian banding scene. In conclusion, many of the aforementioned achievements had other dedicated and talented people make significant contributions. However, Dean's leadership, commitment and skill, and the particular "Dean way" have made a significant contribution to banding in Tasmania and the rest of Australia.